The last thing you want to worry about as your business is growing is scaling your storage infrastructure. After all, data is the lifeblood of your business. With a Managed High Availability iSCSI from Liquid Web, you gain the scalability and power of an iSCSI/SAN without the need to maintain a custom solution yourself. And each cluster includes real-time monitoring, zero downtime upgrades, and guaranteed performance. What are the Basics of High Availability Engineering? High availability reduces single points of failure, makes sure crossover points are reliable, and detects and reacts to failures in real-time, creating a very reliable solution for your business. 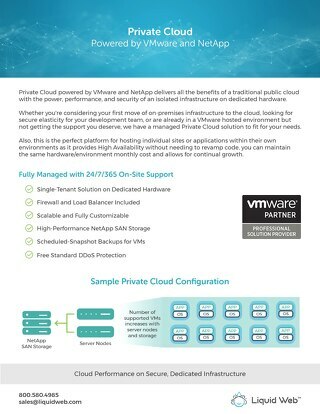 VMware is an infrastructure provider and is used by about 75 percent of businesses that use virtualized servers, and is recommended by most IT professionals as the best virtualization solution. Which Intel Xeon Dedicated Server Should You Choose for Your Business? Liquid Web is happy to announce new offerings under our standard US Zone Dedicated packages featuring the Intel Xeon E3-1230 V6, Intel Xeon Silver 4108, and Intel Xeon Gold 6130. Looking ahead to 2019, many organizations can anticipate migrating their IT systems in order to take advantage of new technology or better service. Here is a guide on planning your 2019 migration. A Distributed Denial of Service (DDoS/DDOS) attack is an attempt to render your server unreachable and generally follows one of two major types, Volumetric or Service-Level. Find out how to stay safe. As any technology reaches the end of its life, there tends to be a group of users who wait as long as possible to switch to a new one. PHP 5 is EOL for security and support, so it's time to upgrade.